In this tutorial, we will be building a simple API, and we will add authentication to it. 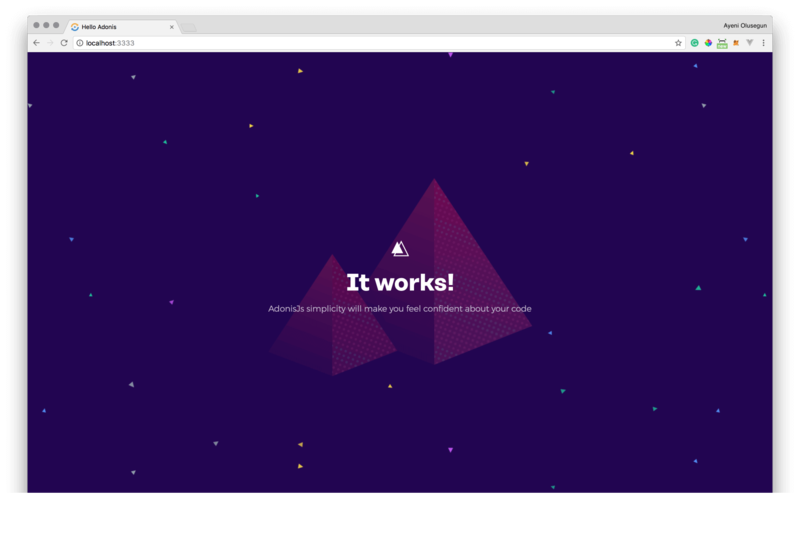 Thanks to Adonis.js this can be handled easily for this awesome framework comes with JWT authentication out of the box. If you don't know what I mean by JWT, you can head over to this link to grasp more info about it. Now it's time to jump into this tutorial. We'll build an API for a blog posts and so only authenticated users can perform some defined operations over posts. The increments() will create an id field with Auto Increment and set it as Primary key. The timestamps() will create the created_at and updated_at fields respectively. We also set a foreign key on the user_id field to ensure that the user submitting post does exist. This has been very simple to achieve :). We're done with that. Our users need to register and to get authenticated in order to perform any sensible operation on our data. When they register, our API will generate an authorization token which he can append to his future requests to manipulate our posts data. Basically we'll build a register and a login function, so we need to create our authentication controller. First make this change in your auth.js file to tell our app to use jwt as our authenticator. The flag --type is to specify the type of controller we want to create, in our case it is an HTTP controller. Now copy and paste this code inside your AuthController file. As expected we have our two functions. The register function creates a new user with the data sent in the request and generates an authorization token for that user, and returns the fresh created user as the response. Our second function login checks first if the user information is valid, then it grasps all their data and also generate an authorization token for them, and returns the logged in user. Note that the generated token will be appended to our future requests as I said above to help authenticate the user and help them perform the intended action on our data only if they are authenticated and recognized by our API system. Our two first routes are for authentication purposes, one for user registration and the other for the user signin. Then we define some routes our users can make requests to in order to manipulate our posts’ data as you can notice :). We add the auth middleware to some our routes that require user authentication because the operation intended is quite sensible, and we need to ensure that the user is authorized by the system to perform that operation. store pulls the requests data to create a new post, associates the current authenticated user as the author, and returs the fresh created post with its associated user. delete at last, finds a post by given its id and deletes from the data, then it returns a message. 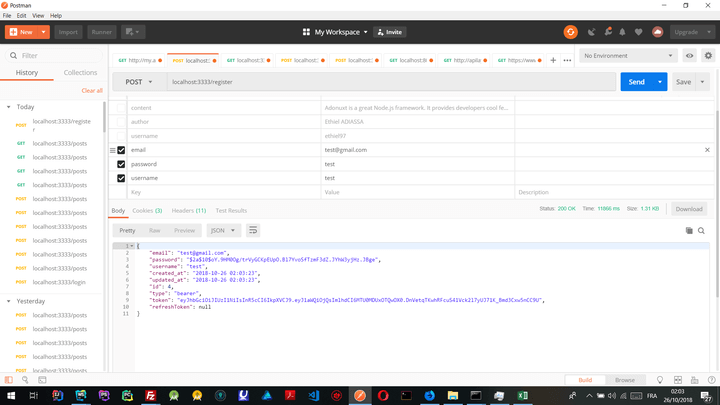 Now let's test the API with Postman. If you don't have Postman, you can get it here. No don't thank me, it's free 😉 . If you don’t know at all how to use Postman, head over to this link to get more insights, and then come back to the tutorial. 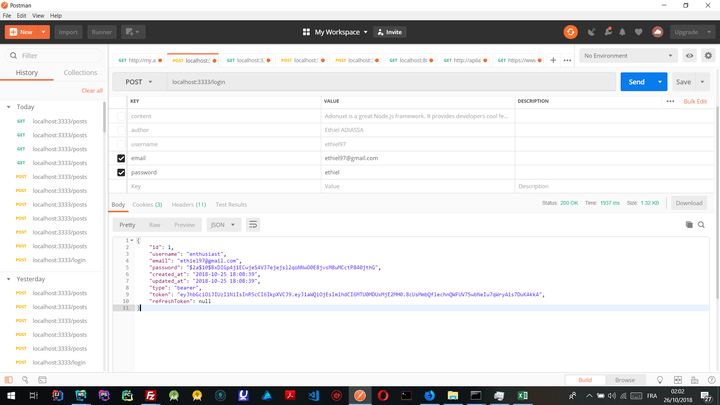 Say we want to get posts from our database, we type localhost:3000/posts to fetch all our posts and select the GET method on the postman UI, and hit the Send button to send your request. You’ll get your posts if they are or an empty array if the database is empty. If you want to register to the system, select the POST method and enter your credentials(username,email,password) in the body tab, check them to take them into account, and hit the Send button to send the request. The response should be a user object containing your authentication token. As you can see in the images below, we've tested some of our routes, let's say the important ones register, login, posts. 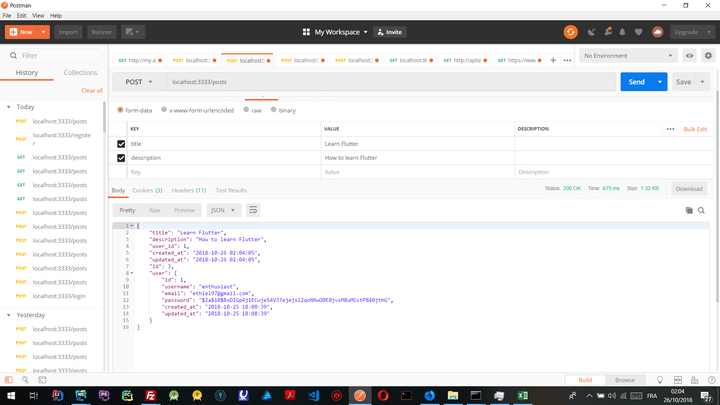 And you can see in the images below that our API is working fine and token is generated on user registration and login. Through this tutorial you've learnt how you can build an API with authentication for your users. I hope this has been useful to you and will help you understand how you can integrate this kind of system into an existing application of yours. Feel free to get the source code of the project on GitHub.